MUK LUK Slippers, Scarves, Hats + More as low as $12.60 Shipped! 65% Off! 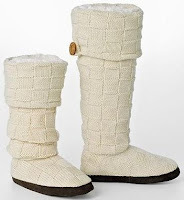 You can score MUK LUK indoor/outdoor slippers, hats, scarves and more for up to 65% off right now at Kohls! NOTE: I'm unable to create a link that shows ALL Muk Luk items. These links will show you a small selection of shoes, so to see everything, just enter Muk Luk into the Kohl's searchbar!